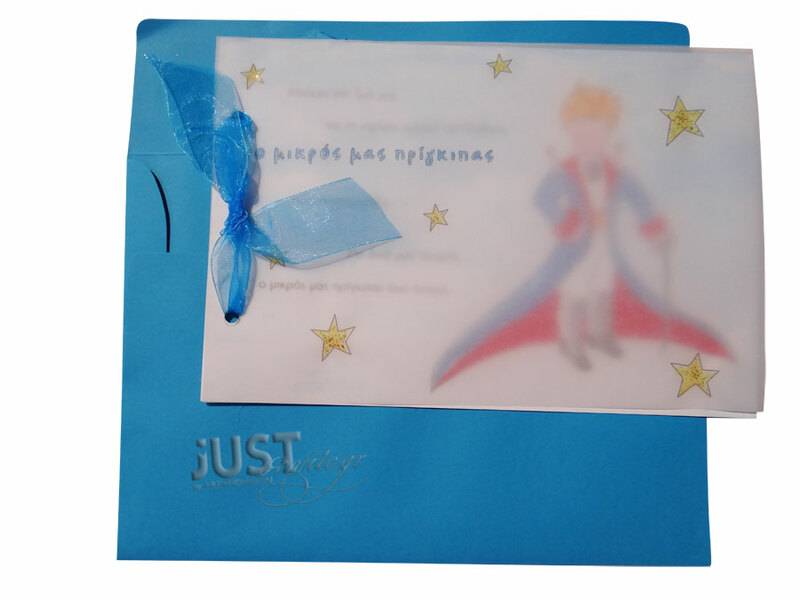 Adorable GreekChristening invitations with Little Prince theme for your baby boy, coming in a card with a Little Prince pattern and rice paper revealing your personalised wording with stars and gold glitter details. The design is finished with a turquoise organza and the matching envelope is long, turquoise paper. Your bespoke invite is printed in plain blue colour. Size: 16 x 23 cm. https://www.preciousandpretty.com/2017/04/baptism-invitations-little-prince-for-boy-C1022.html Greek Wedding Favors|Orthodox Crowns|Stefana|Baptism Invitations Baptism invitations Little Prince for boy C1022 Greek Baptism invitations Little Prince theme for boy. Product #: Greek Wedding Favors|Orthodox Crowns|Stefana|Baptism Invitations_3295707233780623675 5 stars out of 5 reviews.